미술 열심히 할래요. 상 또 받고 싶어요! 프리즘 프라이즈는 우리들의 눈에서 주최하는 전국 시각장애 학생을 대상으로 하는 전문 미술상입니다. 국내 시각장애 어린이, 청소년들의 창의성 개발과 미술교육의 활성화를 위해 마련되었습니다. <Art & Business 프로그램>의 일환으로 시각장애인의 예술교육을 지원하는 기업의 이름으로 시상하며 공모전 입상작은 우리들의 눈 정기전을 비롯하여 국내외 여러 전시를 통해 소개됩니다. 시각장애 학생들의 창의성 개발과 미술교육 활성화를 도모하고 예술적 역량을 지닌 시각장애 학생 발굴을 위해 매년 개최합니다. 2008년 1회를 시작으로 2017년 11회까지 예술적 역량을 지닌 시각장애 학생들을 113명 발굴했습니다. I’m going to work harder in art class. I want to win another prize next year! 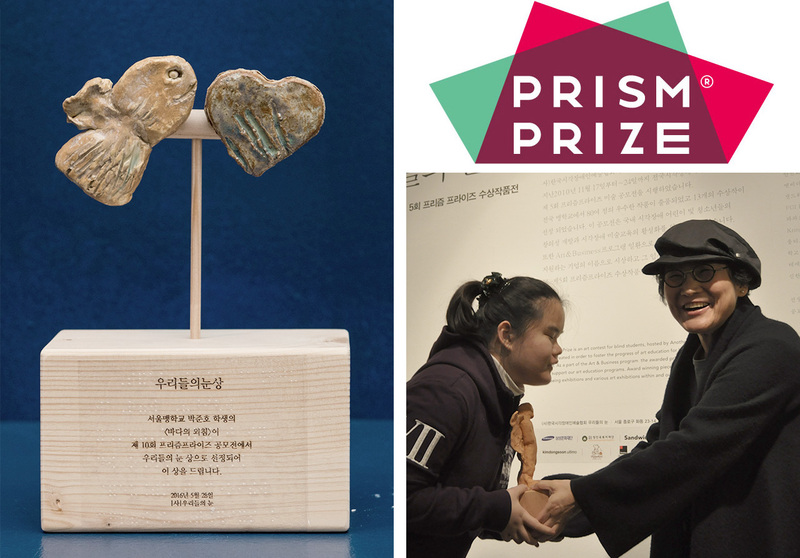 The Prism Prize is an art prize presented to distinguished blind student artists. It was created to inspire creative development in blind youth and promote art education for the blind. As part of the Another Way of Seeing <Art & Business Cooperation Program>, awards are accordingly named after a business or corporation that supports our art education programs. Award winning works are exhibited in an annual exhibition at the Another Way of Seeing gallery, as well as various exhibitions in and out of the country. We award the Prism Prizes each year with the hope of invigorating art education for the blind and discovering new artistic talent among visually impaired students. First presented in 2008, we have awarded a total of 113 blind student artists over the last 11 years.